Abuja — The ruling All Progressives Congress (APC) yesterday met with 223 of its newly-elected members of the House of Representatives in a bid to ensure a smooth sail in determining occupants of the leadership seats of the Ninth National Assembly. APC's National Chairman, Adams Oshiomhole, who chaired the parley held at the Yar'Adua Centre, Abuja, stressed the need to avoid the repeat of the 2015 scenario where members of the opposition People's Democratic Party (PDP) beat the APC to its game by foisting the leadership of the Eighth National Assembly led by Senator Bukola Saraki and Speaker Yakubu Dogara respectively. Oshiomhole assured that strategic committees of both chambers of the National Assembly required to facilitate the implementation of the policy directives of President Muhammadu Buhari-led administration would no longer be left in the hands of the opposition parties this time around. He, however, said that that does not presuppose that APC members in the National Assembly would not work with their colleagues in the opposition parties in the interest of the country.He, therefore, promised to liaise with the Buhari and other leaders of the party to ensure principal positions of the National Assembly are duly zoned in a fair and equitable manner. Meanwhile, former Senate Leader, Mohammed Ali Ndume, has announced his intention to run for the office of the Senate Presidency of the Ninth National Assembly.He has accordingly notified the leadership of the All Progressives Congress (APC) about his aspiration. 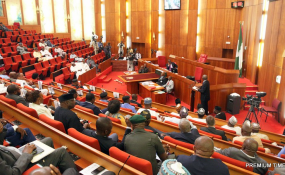 The former Senate Leader, who said he believed the Senate President position would be zoned to the North-East geo-political zone where he hails from, in a letter of intent dated March 25, 2019 and addressed to the APC National Chairman, Adams Oshiomhole, said the decision to seek election into the exalted office was borne out of his desire to help accelerate socio-economic development of the nation. In a related vein, the South-East APC Youths Consultative Forum has enjoined the leadership of the party to zone the position of Speaker to the zone in line with the President's promise of an all-inclusive government.National Co-ordinator of the group, Romanus Oguleme, who spoke with journalists in Abuja yesterday, warned against sidelining the zone as experienced in 2015.He said the excuse in 2015 that South-East APC did not have ranking members to be considered for positions of principal officers can no longer stand again.